i am half finished at make/create the Suggestion from you at making a nameless Gladiator profille i can say you he is abilitie wise a combination between Hundred face Hassan,Spartakus and Iskandar . Last edited by SleepMode; April 16th, 2018 at 03:59 PM. Has anyone been wondering when the OP will be updated? It's getting a bit ridiculous at this point (100+ pages since the last update). I'm fine with that as long as it's not literally an army of Spartacuses or something like that. Actually it'd be funny to see a bunch of buffed men laughing and yelling "LOVE!!!" Don't worry, the only reason Magical Energy is not the most confusing Parameter is because NP exists. If you're concerned, bug Seika. I sent her a profile message a few weeks ago. No reply. Dont worry it will not be either a army of Spartakkusse nor a generic army-Summon but i can say that Spartakus will Play some part there...Nice i try to use this ,King of padoru! Last edited by Kabalisto Koga; April 16th, 2018 at 08:16 PM. Before i post the profile of the Gladiator i would like to hear from all off you here their oppinion which abilities he/they should have after your oppinions ? Little spoiler: i plan to give them four hougu and i have so far two implemented in the profile. You're the one writing up the sheet; I don't see how other people are supposed to tell you what abilities he should have. Four NPs sounds like a bit much, though. I'd suggest lowering it to three at maximum. Okay, let me see if I guess what you got more or less: A Rebellion of Spartacus NP where, of course, every single gladiator participating on it is a Servant, all of them with Heracles-level parameters, and obviously Spartacus is there. Oh, and everyone has a pseudo-Crying Warmonger. Of course, a Domus Aurea Colosseum NP as well, something related to NRVNQSR or paganism in some way because Christians were killed at the Colosseum, a fuckton of Phantasmals because of yes... Oh, and all the gladiators have Independent Action at A/EX rank or something like that because we don't want to fulfill any condition to summon our group of discount Berserkers. About the skills: Bravery, usable as a Berserker because you want to, Battle Continuation, Unyielding Will, Honor of the Battered, Nature of a Rebellious Spirit.... and about 7 skills more, of course all of them at A++++++++/EX rank because what are parameters? Last edited by King of Padoru; April 17th, 2018 at 01:13 PM. Koga, this is shaping up to be another certifiable mess. I only ask that since you’re asking for advice, you actually listen to it. No more than 3 personal skills, actually balance the stats and remember, 1 GOOD NP is infinely better than 5 god-awful ones. Or you know, you could just stop. Unfortunately I don't think Koga knows how to make a sheet that isn't wanked to heaven and back. I tried suggesting to him to at least try making a mid to low tier Servant as an experiment, but it seems he didn't listen. Unfortunately I don't think Koga knows how to make a sheet that isn't wanked to heaven and back. He told me in a private message that "it's his style", so yeah... It's like hitting our heads against Lord Camelot. All of the comments about Koga being the second venomking becomes slightly prophetic in retrospect. At least we're not dealing with Koga and venomking at the same time. Well, let me try to entertain you all before the storm comes then. Alter Ego's true name is Dinosaur Fascination, or just Dino. A unique existence among unique existences. An off-shoot of the servant known as Nursery Rhyme. Nursery Rhyme is a special type of Servant, rather than a hero, it is a Reality Marble that projects the wishes of its Master upon itself. Those are stories that are beloved by children after all, they are the stuff of their dreams and it's not an exaggeration to say that these stories save many children every day. A Heroic Spirit created by children, for children. That's the origin of Dinosaur Fascination. Nursery Rhyme was summoned by a child who needed them and changed itself to fit that child's desires: it was a boy who loved dinosaurs, he loved dinosaur movies, dinosaur cartoons, —and most of all—his dinosaur toys… Nursery Rhyme modeled itself in accordance to that. Those deviated very much from its original concept, but nonetheless the Servant did it. Dino is an off-shoot of Nursery Rhyme, a derivation recorded as a different Heroic Spirit. During that summoning the changes made were too great and the days with that Master too impactful—they are forever recorded in his Saint Graph—there's no way Nursery Rhyme could have served any other child after that, so those recordings were cut-off from it. If not for the existence of the Extra-class Alter Ego, Dinosaur Fascination would probably never be summoned again. Dino may act like a child most of the time, but the perceptive Master will notice that he is much more mature than he appears to be, he just likes to act and behave like a kid, specially if he's around other children. When alone with an adult, Dino will let go of his underage persona and allow his more cynical and sarcastic side to appear—usually along with a smug smile that reveals his sharp teeth. He has no real wish for the grail in this current form, he achieved the best outcome possible for his best friend when he was originally summoned. If he has any desire right now is to exist: to maintain the memories of one unlucky child who managed to be happy for a single day. This is the Skill to build a special terrain that is advantageous to oneself as a magus, such as for the purpose of collecting magical energy. useful, he's better off saving that magical energy. This is the Skill to manufacture magical items, from implements of war to items for daily use. Also, this Skill requires time to gather components and manufacture items. Dino is able to manufacture many familiars in the shape of Dinosaur Fascination with varying quality, power and size, all depending on how much material and magical energy he's willing to spend on them. He can create toys other than dinosaurs, but their quality is much worse and there's not really any reason to do so. "I will change, I have changed. I am you, while you are me. I'm going to change, I will have changed. I am you and you are me." "I won't change. I have changed before, but never again. I'll forever maintain this dear form I love." This skill has been sealed. This is the aptitude to remold one's own body or merge one's own flesh with body parts of others. The higher the ranking in this Skill, the further away one is from being a proper hero. A special grade remodeling done during a summoning. 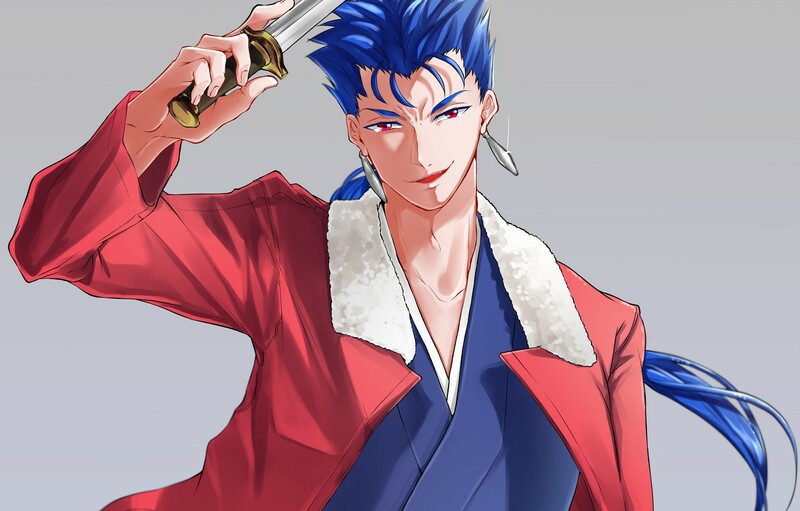 It has completely separated him from the original Nursery Rhyme, making Dino into a different Heroic Spirit restricted to the Alter Ego class. This is a Skill that denotes the ability to ride mounts and vehicles. Most vehicles and animals can be handled with above average skill. However, cannot ride the likes of Phantasmal Species. An ability granted due to his ability to ride his toys or the minions his Noble Phantasm generates. Dinosaurs would be generally classified to be on the level of Monstrous Beasts, but his toy familiars are one rank bellow that. Though, if he ever somehow got ahold of an actual dinosaur, a "+" modifier would be applied to allow him to ride it. Mystic Code (Dinosaur Costume) C+. A skill granted to one who possesses a particularly powerful or important Mystic Code, in this case, a cute dinosaur costume. Dino's costume is more akin to a different reality texture superimposed over him and cannot be removed. The costume grants Animal Dialogue C in addition to another ability, depending on the prehistoric animal depicted currently. Examples are: Scream of Fear D from Spinosaurus aegyptiacus, flight from Tupandactylus imperator, Affection of the Goddess D from Quetzalcoatlus northropi, Monstrous Strength D+ from Tyrannosaurus rex, etc. Also, for some reason making the T. rex costume purple grants him Proof of Friendship B instead. "If you want dinosaurs, then you won't find a place better than this! A child's dreams are even better than reality! Dinosaur Fascination!" , it should be a mirror-like projection of its Master, but in this case it is forever colored by the child who originally gave origin to Dinosaur Fascination, granting him aspects of that boy's favorite things. , a "playground" that recreates the overwhelming sensation that child felt when he visited a museum for the first time. Those inside the museum have dinosaur facts constantly fed to their mind, the stream of information is so massive that any other brain functions are drowned out, gradually preventing them from taking any actions. The only way to escape this effect is to reassure yourself about how you don't care about prehistoric creatures; of course, that has to be true, anyone who actually cares about dinosaurs and such is essentially doomed. Also, inside the museum, the summoning of Sue the Tyrannosaurus along with an assortment of cartoon dinosaur minions is possible. Sue is the largest and best-preserved T. rex specimen ever found, her living self is the one being summoned: a massive animal on the level of a Monstrous Beast. The cartoon dinosaur minions are not particularly powerful (a regular human would probably be able to fend off a small group of them easily), but Dino can produce about forty and they are vicious; after all, you'll never find a child that doesn't play with their dinosaur toys by making them fight: these creatures are essentially living weapons that only exist to fight for entertainment. Destroying them is also very difficult since they can reform themselves regardless of how damaged they are, the only way to defeat one of them is to destroy their entire body completely. "This is a Bottomless Toy Box. His dream lives on, even now..."
Bottomless Toy Box. The Reality Marble that is Dinosaur Fascination assumes the ultimate realization of a certain boy's desire: someone that won't go away, a best friend who shares his interests. It is only active while inside his territory, be it the "thematic toy store" or The Land Before Time. If Dino is defeated, one of the toy boxes will open up, revealing another one. This newly summoned Dinosaur Fascination is a different existence from the one that was destroyed and will not have any memories from this current summoning. This process can be repeated indefinitely as long as the magical energy supplies lasts. You can easily have more than one Dinosaur Fascination summoned at the same time by opening the boxes, but that'll mean his Master will need to sustain each of the Servants, greatly reducing each one's powers. Also, destroying the toy boxes will release the magical energy they contained, and that can be used by an opponent to prevent Dino from summoning any more copies. Essentially, Dino is a servant who excels in overwhelming his opponent: harass with toys, confuse by changing costumes, assault with information, attack with cartoons and Sue, and keep himself alive long enough for all those to work. This makes Dino a very strong Servant that can be a serious thread is he manages to get his set up right, but due to his "long game" strategy, he has no chance against great Heroic Spirits able to unleash powerful area-of-effect attacks without issue. He was summoned by an unlucky child with no hope of salvation. An unlucky child who wasn't happy before and was doomed the moment they summoned a servant. But that sight, that moment right before his end. For the boy, that moment was certainly salvation. "The original. So, you ended up influenced by your Master too huh? Wait, why can you do it while I get throw out?!" "Isn't this a bit…? Well, I guess you're a good girl for now so it's fine. Man, adults really are the worst." "Hey Gil! I just got the best idea: a giant sauropod versus mini dinosaur-people, but give them only holy swords!" Best friends in Chaldea, their war games are truly a sight to behold. At first, he thought he finally found an adult who understood how being a child is much better, but Andersen's personality quickly changed his mind from "new best friend" to "faker scum". Even then, he can't cut his ties completely because he looks like a child, and also because Dino can't help but see Andersen as a kind of father figure almost. Basically, he pesters, bullies and pranks Andersen whenever possible. He doesn't really hate adults themselves, but adulthood. He hates the world of adults that can't do anything to help a sad boy, a childish fantasy is much better. To her, he's the cutest boy ever, the ultimate little brother. To him, she's the only good adult, the ultimate big sister. Quetz spends all the time pampering him and taking him on rides on her Quetzalcoatlus. Also, since she's blind to any of his faults, she doesn't lecture him against bullying Andersen but rather participates in it. Andersen is basically traumatized by their identical smiles at this point. I always thought it would be interesting to apply Nursery Rhyme to something else, and since I love dinosaurs since I was a kid, there it is. I don't think the execution is perfect though, I think I could have made him either more connected or more separated from NR. I initially was going submit this to the monthly contest but I think I deviated too much from the Animal theme for it to work. Also, no, pterosaurs are not dinosaurs, but for a child this doesn't matter much, any prehistoric history costume is going to be called a dinosaur costume.